The national Institute of grapes and wine "Magarach" a device has been developed for inclusion in the technological scheme of preparation the autolysates of yeast as the main technological element, and also for the preparation of suspensions bentonite during technological processing wort and wine with the purpose of clarification and stabilization. Technological the cycle of receiving yeast autolysate: treatment of yeast mass in installing → extract-treated yeast mass within 10 days in the tank (for produce a concentrated yeast autolysate) or adding yeast mass immediately after processing the raw materials in the required quantity with exposure in for 10 days (in this case, the decreasing of the mass concentration protein in the wine stock as a result of active proteolytic enzymes). The result is a wine enriched the autolysis of yeast. The main the material, which used in the manufacture of stainless steel. Features design: working body installation is a specially designed cage mill: two rotating in opposite sides of the rotor. Each rotor also consists of disks connected with the annular disks steel fingers and mounted on separate shafts. The shafts of the rotors are in the rotation of the individual motors. Circular pumping product installation provides processing in cavitation mode that allows to guarantee the complete destruction of the yeast cells and to induce their autolysis, and provides the activation of bentonite and does not require its swelling. The installation has no foreign and domestic counterparts. 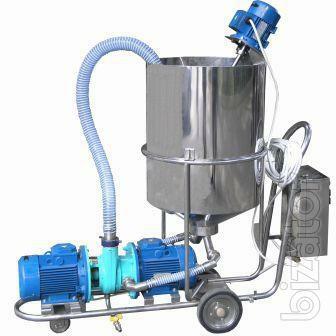 Allows complete autolysis of yeast in Overdrive mode with warranty its quality. The application of the autolysates of yeast contributes to the quality champagne and wines, cognac, table and fortified wines. yeast with any of their physiological state day. yeast with any of their physiological condition, day.